Heavy & hairy are great adjectives when it comes to mascara. I mean, this cheap as chip mascara really delivers what it promises; Length & Volume, with smudge proof finish. Of course, it didn’t promise curling, and with this heavyweight wonder, you definitely need a lash curler, as it loads & supersize you lashes in one single stroke. The money you saved by using this mascara will get you a posh curler like Shu Uemura or Chanel in no time. Lash Blast Fusion lasted almost 12 hours on me, on a hot sunny day when I am drenching in sweats hovering my house. I am impressed. Posted in Cheap & Cheerful, Make Up and tagged Covergirl, lash blast fusion, mascara. Bookmark the permalink. Looking for a classic, no nonsense, hardworking, buck saving, basic & concise product that’s delivers what it promise? 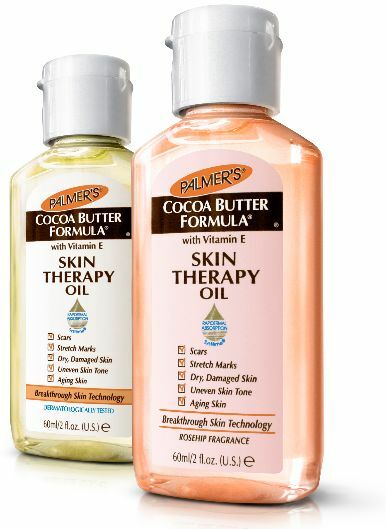 Palmers Cocoa Butter Formula Skin Therapy Oil is a fast absorbing, preservative free, lightweight ‘ dry ‘ oil ideal for daily moisturising. A blend of powerful botanical oils such as Rosehip, Sesame and Canols oil together with pure Cocoa Butter and Vitamin E, Skin Therapy Oil is an all-in-one skincare solution. Formulated with Palmers unique Rapidermal Absorption System for maximum penetration of the epidermal layer allowing the powerful ingredients to deliver targeted benefits. The 60mL bottle may appear tiny, but this pint sized wonder is full of breakthrough technology targeting SCARS, STRETCH MARKS, DRY & DAMAGED SKIN, UNEVEN SKIN TONE and AGING SKIN. Its unique Rapidermal Absorption Système® allows active ingredients like Vitamin E to penetrate skin really fast, leaving you deeply moisturized yet non greasy. This silky oil will not stain clothing due to its unique texture & superb absorbability. I am totally amused by how lite & non greasy this oil feels upon application, It almost sinks in immediately & left my skin feeling silky soft. My dry, irritated & itchy skin ( thanks to those flea bites ) was instantly pacified, smoothed & nourished. In terms of scar battling properties, you could read about Tine’s raves here. Ingredients : Canola Oil, Isopropyl Myristate, Cetearyl Ethylhexanoate, Sesamum Indicum Seed Oil, Tocopheryl Acetate, Dimethicone, Theobroma Cacao Seed Butter, Fragrance, Rosa Canina Seed Extract. A great bargain not to be missed. Posted in Cheap & Cheerful, Lotion & Potion, Money Monday and tagged canola, cocoa butter, Palmers, rosehip, sesame, skin therapy oil, vitamin E. Bookmark the permalink. It’s Money Monday, where LPB is going to feature something, something either dirt cheap as chips or something that’s gonna cost you an arm or a leg. Rich lipstick which provides gorgeous, high-pigment colour, even finish and improved vibrancy, while actively moisturizing your lips, making them smoother and softer in just one week. Max Factor Colour Elixir formula is infused with a 60% blend of skin emollients, conditioners and antioxidants including vitamin E, white tea, shea, avocado and aloe butters. 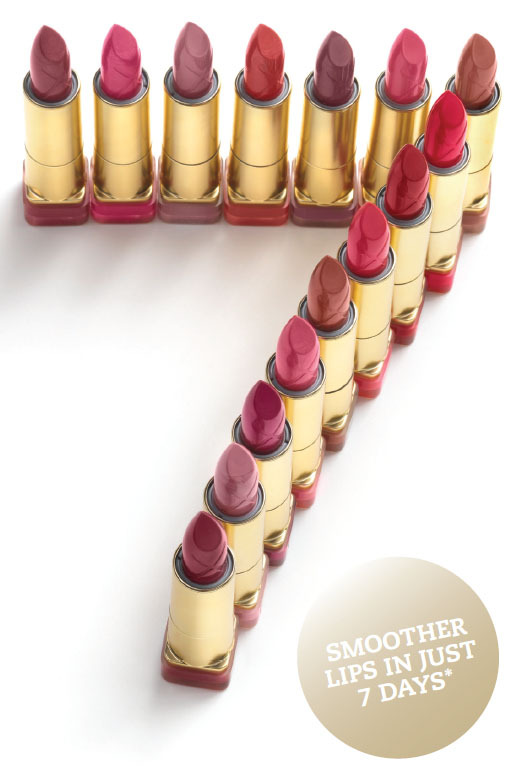 Vibrant colours & soft, kissable lips for under £8? Load them, truck load them. Posted in Cheap & Cheerful, Make Up, Money Monday and tagged colour elixir, lipstick, Max Factor. Bookmark the permalink. The goal of effective cleansing is to loosen and remove dirt, germs, excess oils, dead cells, cosmetics, and medication residues without irritating the skin or drawing away needed moisture. CeraVe Hydrating Cleanser gently cleanses the skin while helping to maintain the right moisture balance. It is proven to prevent moisture from escaping ( evaporating ) from the skin’s surface. 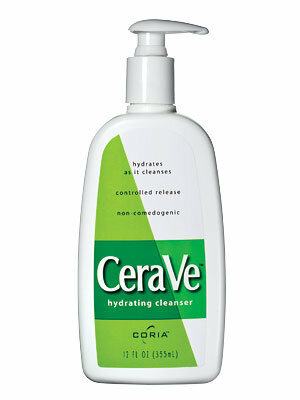 CeraVe Hydrating Cleanser provides gentle, effective cleansing while it restores and enhances the skin barrier. Its fragrance-free, moisturizing formulation is non-irritating and non-comedogenic ( does not cause pimples or acne by clogging the pores ). Like all CeraVe Skin Care products, CeraVe Hydrating Cleanser offers the benefits of unique, patented MVE delivery technology, which provides a controlled release of essential ceramides and other skin-nurturing and protective ingredients slowly over time. The unique ingredients in CeraVe Hydrating Cleanser help restore and maintain the natural protective function of the skin, help restore damaged skin, and help keep skin healthy. CeraVe Hydrating Cleanser never leaves a greasy residue. This soft, non foaming milky cleanser is truly mild yet effective. It cleans the skin gently & is easily rinsed off without sticky residue. It’s a great basic face cleanser ( not a makeup remover ); IMO, better than Cetaphil in terms of effectiveness & rinse-ability. CeraVe hydrating cleanser also cushions & feeds my complexion with skin conditioning ingredients; My skin is softer, smoother & calmer after using this, even on the day after my weekly Retin A treatment. A great product endorsed by LPB ! Posted in Cheap & Cheerful, Lotion & Potion and tagged CeraVe, Cetaphil, gentle cleanser, hydrating cleanser. Bookmark the permalink. 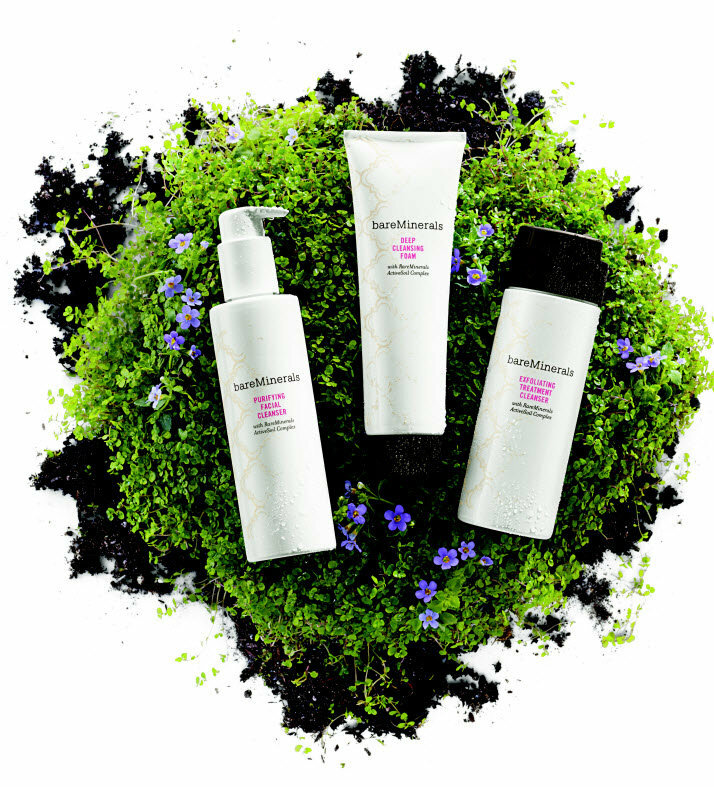 There is a new way to keep out skin beautiful with the new BareMinerals skincare line from Bare Escentuals offering cleansers, moisturizers and facial treatments that contain no synthetic fragrances, artificial oils or parabens; all reasonable priced. There are 3 different sulfate-free cleansers to help keep skin cleansed. Purifying Facial Cleanser -Removes makeup dissolves impurities and rebalances skin for a soft, smooth complexion. Skin is left perfectly clean, instantly hydrated and renewed. Deep Cleansing Foam -A luxuriously rich cleanser deep cleans pores and lifts away impurities. Exfoliating Treatment Cleanser -This delivers a potent concentration of ingredients for a brighter, smoother complexion with noticeably smaller pores. The Deep Cleansing Foam is a water-activated foam cleanser in a tube. In addition to the ActiveSoil Complex, there’s avocado oil, starfruit, and grape seed oil for added antioxidant protection and skin therapeutic benefits. Luxuriously foaming, this cleanser only requires a small amount ( pea size ) for a creamy, dense foam that cleans ( averagely ). The aroma is non cloying & rather acceptable for its price. However, it doesn’t rinse of completely and I could still feel some residue after vigorous rinsing. It doesn’t leave my complexion sparkly clean, instead, it can makes your skin taut if you’ve drier skin. I think this cleanser is just an average, affordable cleanser that had been over raved. Due to its creamy foams, I find this excellent to be used as a shaving cream, leaving your skin smooth & firm ( I mean taut & toned ). Ingredients : Water/Aqua/Eau, Stearic Acid, PEG-8, Myristic Acid, Glycerin, Potassium Hydroxide, Lauric Acid, Alcohol Denat., Butylene Glycol, Glyceryl Stearate SE, Propanediol, Polyquaternium-7, Soil Minerals, Sodium Methyl Cocoyl Taurate, Glycine Soja (Soybean) Oil (Glycine Soja), Trisodium EDTA, Lavandula Angustifolia (Lavender) Oil (Lavandula Angustifolia), Lavandula Hybrida Oil (Lavandula Hybrida), Linalool, Vitis Vinifera (Grape) Seed Oil (Vitis Vinifera), Persea Gratissima (Avocado) Oil (Persea Gratissima), Punica Granatum Seed Oil (Punica Granatum), Phytosteryl/octyldodecyl Lauroyl Glutamate, Limonene, Anthemis Nobilis Flower Oil (Anthemis Nobilis), Averrhoa Carambola Leaf Extract (Averrhoa Carambola), Tocopherol. Posted in Cheap & Cheerful, Lotion & Potion and tagged BareMinerals, cleanser, deep cleansing foam. Bookmark the permalink. 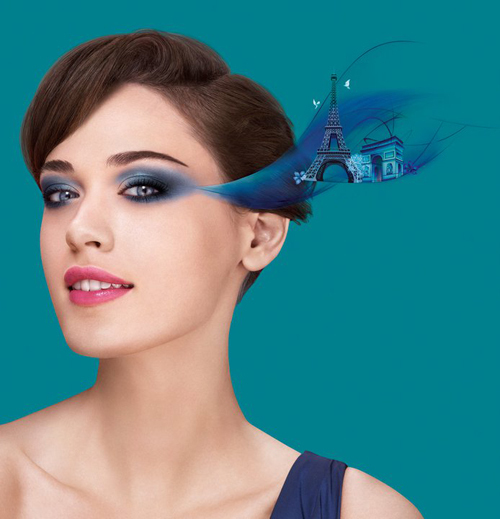 Packed with the pigment which gives intense colour and depth. They claim to last for 16 hours without fading or smudging! It comes with a foam applicator and a soft brush; You can use the eye shadows both dry or damp. The soft brush is great for all over shading. The more affordable version of YSL Pure Chromatics or Armani Intense Eyes To Kill, without compromises in pigmentation intensity & colour wear. Posted in Cheap & Cheerful, Make Up and tagged Bourjois, eyes to kill, eyeshadow, Giorgio Armani, intense extract, pure chromatics, Yves Saint Laurent. Bookmark the permalink. I have difficulty categorising this; Is this a beauty product, a prank or a revenge tool ? 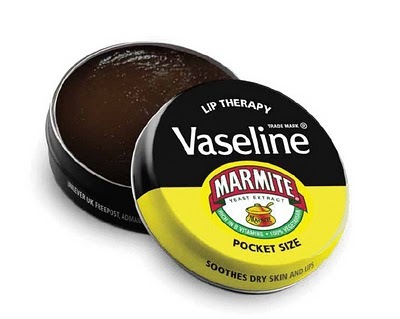 After perfume that resembles bodily parts & secretions, now we have saucy lip balm. 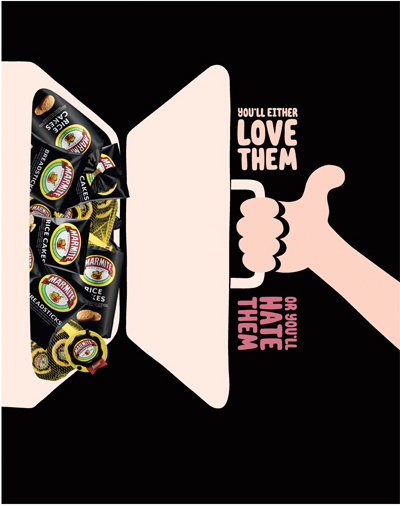 Yes, I like marmite ( by ingestion ) but I don’t think I would like my lips to smell of food. Savoury lips anyone ? What’s next ? Brown Sauce / Chap Swee / Tikka Masala / Wasabi ? One day, this might comes true, watch out girls! 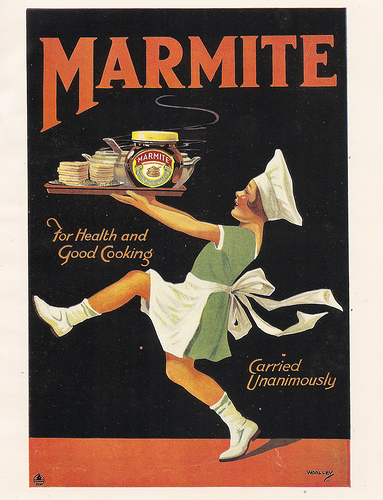 Posted in Cheap & Cheerful, Humour, Lotion & Potion and tagged lip balm, Marmite, Vaseline. Bookmark the permalink.